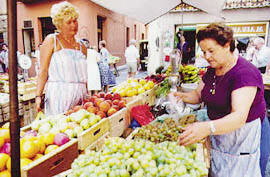 For many Moraira holidaymakers and residents the street market is a major attraction. Apart from the exciting, crowded atmosphere it is probably true that there better quality and cheaper fruit and vegetables than can usually be obtained in the Moraira supermarkets. Moraira market also offers a wide range of other products including carpets, clothing, leather wear, household linen, jewellery, watches, and domestic electrical equipment. Some care is necessary because there is always the risk that one might not be able to get a refund or exchange if the goods prove to be faulty and this should be reflected by the price. On non-food purchases one should always be ready to make an offer, in fact the stall holder may well be quite surprised if you accept the asking price. Markets open around 9 AM, sometimes earlier, and close at lunchtime. If the market day proves to be a fiesta then it is changed to the day before. Moraira Market - is held every Friday morning and is located just behind the town, in the large car-park. This creates a massive parking problem so it is necessary to get there very early. Moraira-Teulada Corporation have plans to increase the number of parking places in an underground car park. This will be located between the beach and Moraira town. When completed Moraira market will be held in the square on top. Moraira is one of the most extensive Costa Blanca markets and a visit can be an interesting holiday experience. All types of fruit and vegetables are available, including nuts, herbs, dried fruits and spices as well as clothing, footwear, leather and ceramic goods, carpets, soft furnishings and household goods. Teulada Market - A smaller, less touristy market but with a quite extensive range of produce that tends not to be as crowded as Moraira. It is held on Wednesday morning and there is usually a particularly good range of fruit, vegetables, nuts, dried fruits, herbs and spices. Many Moraira area residents shop here - so it should be good! Quite a small market in a very busy town. Parking is always a problem but the market is close to the railway station and you can catch a train from Teulada. Mainly fruit and vegetables - good prices and quality. A large and busy market which caters for the holidaymakers of this resort. Located in the Old Town. Fruit, vegetables, fish, meat and some furniture and antiques. Picturesque and very busy. Very good local fruit and vegetables, souvenirs, gifts, clothing, etc. A car-boot sale or rastro, some good second-hand furniture and antiques. The Moraira evening market, with numerous stalls on the pavements of Moraira village, selling handicrafts, gifts, pictures etc.